In our new ‘Monthly Round-up’ Canelo Digital Publishing Limited is delighted to announce a number of exciting new authors and books that we have recently acquired. Fergusson’s stunning debut – A Dangerous Act of Kindness – is a suspenseful, tender and at times harrowing historical love story set during World War Two that will appeal to fans of Rachel Hore and Santa Montefiore. Author Andy Redsmith’s urban fantasy crime novel – Breaking the Lore – explores the question of how a seasoned Manchester detective can stop a demon invasion…when he doesn’t believe in magic! Mischievous and mystical, this debut is perfect for fans of Douglas Adams and Ben Aaronovitch. The Particular Charm of Miss Jane Austen was ‘liked’ during the 2018 #CaneloPit…and acquired soon after. This uplifting romantic comedy sees a time travelling Jane Austen trapped in modern Bath, with avid Jane-ite, Rose, the only woman who can correct the course of history! The Particular Charm of Miss Jane Austen will be published on 12th September 2019, ahead of the annual Jane Austen Festival in Bath. The sequel will follow in November 2019. With glamorous settings, characters with secrets up their sleeves and clever plots that keep the reader guessing, Vivian Conroy provides pure sleuthing fun with the first book in her new cosy crime series – A Testament to Murder. Perfect for fans of Agatha Christie and Ann Granger. A Testament to Murder will be published in February 2019 with the as yet untitled sequel to follow in October 2019. Connect on Twitter under @VivWrites or drop by #histficchat, a live Twitter chat on Thursdays from 8-9PM GMT/3-4PM EST. The first book in the epic new ‘War of 1812’ series from author AJ MacKenzie – The Ballad of John MacLea – sees Captain John MacLea is charting his own course against a background of uncertain loyalties and certain danger, fighting not just for freedom, but for his life. A sweeping historical adventure sure to please fans of Conn Iggulden. 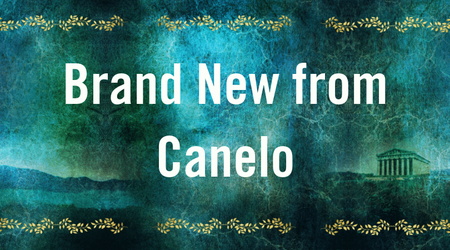 In Carol Wyer’s Canelo debut – What Happens in France – Bryony Masters is on a mission to find her long-lost sister and reunite their family. With the help of handsome friend Lewis, she snags a coveted spot (and global attention for her search) on a primetime game show with a cast of truly unique characters. What Happens in France will delight fans of Fiona Gibson, Daisy James and Jo Watson. Award-winning New Zealand YA and Adult fantasy writers David Hair and Cath Mayo captivate with their Canelo debut – Athena’s Champion. Prince Odysseus of Ithaca’s world is torn apart. Now, only his wits, and his skill as a warrior, can keep him ahead of the Gods’ power games – and alive.